Sft During the bridge deal phase, when dividing the deck for the two spectators to shuffle, I recommended using a faro check. II you prefer, you can instead use a key card. When you ribbonspread the deck face up, memorize the lowermost card of the spade/heart half. After the Laurie Ireland shuffle, this card will be twenty-sixth from the top and will key you where to split the deck. 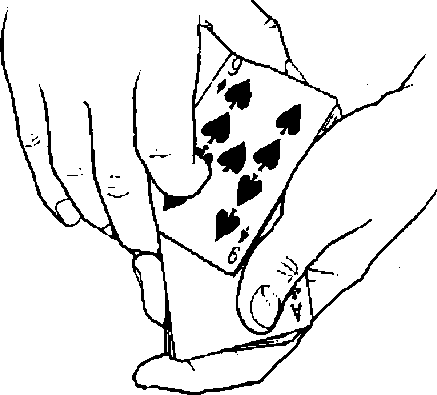 After the two spectators each shuffle half the deck, I described the handling using a push-through shuffle. You can, however, use almost any false riffle shuffle including the in-the-hands variety. For example, if using a Zarrow shuffle, drop the rightmost spectator's cards on top of the leftmost spectator's cards. Then cut off about twenty cards and Zarrow shuffle them under three or four cards. You should he able to work out the necessary adjustments for whatever false shuffle you want to use. Keep in mind, however, that the goal is not to give the deck an elaborate series of shuffles. The important shuffles are the ones the spectators just did. You're merely combining the halves by riffling them together. ^ If during the poker deal phase (or any runup demonstration) a spectator should ask how you would control the four of a kind to the top during a game, the perfect answer is to follow up the routine with Combination Cull.